Founded in 1975, Canine Companions for Independence has become the largest provider of assistance dogs for children, adults and veterans with disabilities. It is recognized worldwide for its excellence. Over its 40 year history, Canine Companions has placed more than 4,800 highly skilled assistance dogs with people with disabilities, including over 130 placements with veterans through the organization’s Wounded Veterans initiative. Canine Companions places these exceptional assistance dogs and provides ongoing follow up entirely free of charge. Four types of assistance dogs are trained by Canine Companions including service dogs trained in tasks such as retrieving dropped items and pulling a manual wheelchair, skilled companion dogs for children and adults with physical or developmental disabilities who require an additional handler, hearing dogs trained to alert deaf and hard of hearing handlers to sounds in their environment, and facility dogs that work with professionals in educational, healthcare, or visitation settings. 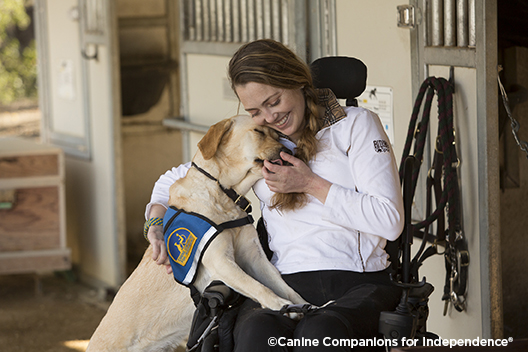 Thanks to generous donors and dedicated volunteers, Canine Companions continues to enhance independence for people with disabilities and demonstrates that help is a four-legged word.